The Snarled Skein | pardon our mess, while we reorganize the site! anyways, seeing that i’ve been gone so long, i decided that upon coming back to the site, i wanted something new. if you can bear with me just a little longer, i’ve a few more changes to make to the site and then i can get back to regularly posting. and i’m really looking forward to it!! hope to see you on the other side of the construction! i’ve been playing world of warcraft since march-2005 and… ok, FINE, i’m not just a fan, i’m an addict. many moons ago, on my first trip into the hinterlands, i discovered “owlbeasts” and instantly HAD TO HAVE ONE. part bear, part owl/bird, part feral cat – they’re adorable in their ferocity! big beast rawrs at me and i’m all, “aww, lookit it, isn’t he cute?” (and then i club him with my mace, because that’s, like, what you do!) when i finally had the chance, i created my own druid who could take on the same form, known as “moonkin“. 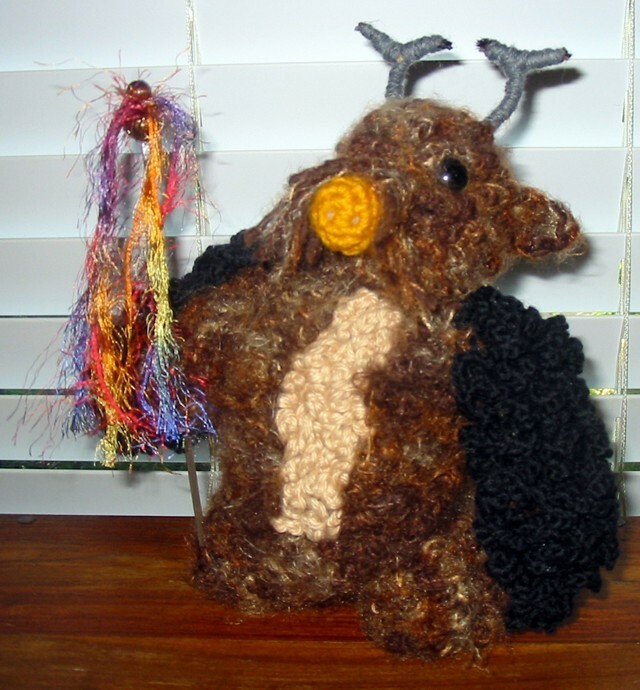 and now i’m selling Boomie, The Warcraft Moonkin Crochet Pattern at etsy! he stands about 7 inches tall and he’s soft, squishy, and cuddly! if you cannot crochet and would be interested in ~the finished product~, drop me a line! things are still crazy… a whirlwind of doctor visits and errands for mom, prior to her surgery (on the 30th! – keep your fingers crossed for us! ), but somewhere in the midst of it all, i’m making sure i have time to crochet! here’s a few pics of my latest additions. you can purchase them at my shop on etsy! coming/going/spinning around in circles – it’s been that kind of month. on the way to san antonio to sit with my aunt for her open heart surgery, i stopped by mom’s place to pick her up. found mom in bed, completely unresponsive. called 911. she spent a week in the hospital. my aunt’s heart surgery was postponed 3 days. mom had a heart cath and found out she has a faulty bicuspid valve, which needs surgery. aunt not doing so well (she’s 82, diabetic, and had a triple bypass – i wouldn’t be doing so well either). AND i have an interview today with UT (*fingers crossed*). of course, since i was spending all this time sitting around a hospital room, i did the only thing any sane person could do: i dragged my crochet with me! have guild, need sword! it’s the rules. so i finally got around to joining the crochet guild of america! but, of course, the rule is: you can’t join a guild without a sword and… (ok, mostly that’s just my rule, but a good rule it is, nevertheless! )… i set out immediately to forge mah sword! 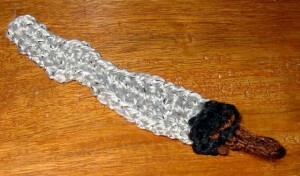 don’t make me poke your eye out with mah hefty 3-inch yarn sword!!! i’m working on a real piece that i’m excited about, but that is taking mmmmmmmuuuuuuuuuuuccccccccccchhhhhhhhhh longer than i wanted it to. mostly because i’m excited to see how it all turns out and whether it will turn out the way i have it in my head. *crosses fingers* but, in the meantime, EN GARDE! Proudly powered by WordPress | Original Theme: Duster by Automattic. | Modified by arindesigns.